Moving ahead 89 pages. The Van Cleve family were the first group of settlers to arrive at Dayton in 1796. Margaret Van Cleve-Reeder and her husband George moved their family from the Cincinnati area to Centerville in 1811. 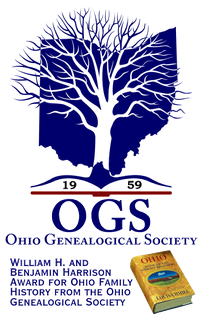 The family of Dan Wright Sr. with adult children Asahel, Porter, Dan Jr., and Elizabeth entered Ohio in 1814 and settled in Centerville. At Centerville in 1818 Dan Wright Jr. married Catherine Reeder, Margaret Van Cleve-Reeder's daughter. 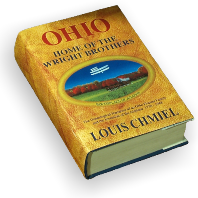 In 1823 the Dan Wright Jr. family moved to Indiana and the remainder of the Wright family led by Asahel Wright moved to Bethel Twp., Miami County, Ohio in 1826. They had followed William Van Cleve up north of Dayton. William moved up to Wayne Twp. in 1823 after marrying Asahel's sister Elizabeth Wright. They were both intent on taking advantage of the future commercial prospects of the pending National Road. In the spring of 1826 Asahel Wright had finally put into place the last two pieces of his plans for change. On the sixth of April he completed a transaction with Hugh Alexander for the sale of his stone house in Centerville. He was now prepared to pack up the remainder of his belongings and his now notable family for the trek northward to the edge of the pending National Road. As with many Ohio farmers, Asahel Wright was looking forward to gaining financial advantage by being in close proximity to the coming road. He had worked out an agreement with Felix Hoover to purchase a 113-acre farm on the road between Dayton and Troy up in Bethel Township, Miami County (see map on pg. 635). His property would sit just twenty-five feet south of the proposed route of the National Road and he had made an agreement with a Dr. Stone to purchase a piece of the land adjacent to his land and abutting the National Road, at a later date. Part of the the agreement with Felix Hoover included a transfer of the twenty-five-acre farm on which Asahel’s father Dan Sr. was living, at present day McEwen Road and Rt. 725, as well as the remaining ten acres of wooded land in section 36 west of Centerville (see map on pg. 619). These transactions would be consummated later in the year, in October. That April, a farm wagon rolled up Dayton Troy Road carrying the family of Asahel Wright, six in number, to their new home in Miami County. In 1826 Asahel Wright was forty years old and his wife Martha was thirty-two. Their four children were Edmund age four, Samuel three, Sarah two, and John Quincy nine months. Their wagon crossed over the Montgomery / Miami County line and went a half mile further on to an open section of land on the right side of the road which had been designated in 1812 for the Bethel Cemetery (see map on pg. 635). At the north side of the cemetery they came to a spring running beneath the road. Off on the right side of the road just beyond the spring, out in front of 113 acres of farmland and orchards, sat the two-story log house that would be home to the family of Asahel Wright. The farm would be home to the Wright family for the next twenty-six years. land to be explored with fruit trees by the scores to be climbed and tall rows of corn to hide in. In addition, there was the nearby Charleston Falls to visit periodically with the family. It was a great place for young boys to grow up. In a few years they would have their young brother John Quincy tagging along with them as well. The Wrights were putting down roots in an area where most of the families around them had just settled in within the last decade. A few miles north of Asahel’s farm, just across the line into Staunton Township in Section 1 on Dayton Troy Road, lived the family of Thomas Heywood and Sarah Copeland-Heywood (see map on pg. 643). The Heywood family with their six children came to Miami County in 1819. Two of the Heywood’s sons, Nathaniel and Alexander, would a few years down the road, marry into the Wright-Van Cleve clan. A half mile south of the Wright farm, immediately south of the Bethel/Wayne Township line on Dayton Troy Road, was the 160-acre farm of Samuel McFadden. It was here that Catherine Van Cleve, daughter of William Van Cleve and Sarah Miley-Van Cleve, would live for seven decades after marrying Samuel McFadden’s son Hugh. A mile west of the Wrights, along the pending National Road where the community of Tadmore would grow up, was the family of Stephen and Anna Allen. The Allens had settled on their quarter section of land in 1815 (see map on pg. 635). Another generation down the road Eliza Jane McFadden, the future daughter of Hugh and Catherine McFadden would marry Marquis L. Allen, son of Stephen and Anna Allen. Marquis and Eliza Jane Allen would live on the Allen farm west of Dayton Troy Road all their lives. From the 1890s through the turn of the century, Herbert Allen, the son of Marquis and Eliza Jane Allen, grandson of Catherine Van Cleve-McFadden, and great-grandson of William Van Cleve would maintain a letter writing relationship with Milton Wright in search of his Van Cleve family connections. In the decade after the Wrights moved into Bethel Township Peter Arnold would acquire a ninety-five-acre farm a half-mile east of the Wrights (see map on pg. 635). In the mid 1840’s Peter’s sister Anna would marry Asahel Wright’s son Edmund. Up on the northern border of the township Staley’s Mill, the most formidable mill in the township, had been in operation since 1815. It was into this neighborhood, amongst these families, that the Wrights moved to create a new home and opportunities for themselves. It would be a neighborhood where families would grow to know one another well over years of living together and would produce grandsons and granddaughters of these pioneer families who would continue to live in the area and have children of their own. When Asahel Wright moved into the area of south Bethel Township his move coincided with a handful of developments that created a small nexus of social and commercial destinations in the area which made it a hub of gathering to the surrounding farmers. In the same year that the Wrights settled into their home, on the north side of the spring running through their farm, the Bethel Reformed Church was founded. Members began gathering for services on Sundays on the south side of the spring next to the Bethel Cemetery. The congregation gathered outdoors under the pines that first summer while construction of their church was under way. In the coming years the church’s membership would grow to over a hundred faithful souls, with many of the residents of Wayne Township joining in the Sunday pilgrimage of horse-drawn wagons easing up to the small country church. The volume of wagons converging on the church on Sunday mornings would line both sides of Dayton Troy Road from the north and the south. The next year, in 1827, township officials selected the site for the first school in the area just a half mile north of the Wright home on Dayton Troy Road. The one room brick school house was built a few hundred feet north of the pending National Road, on the west side of Dayton Troy Road (see map on pg. 635). It was a location that boded well for the children of Asahel and Martha, giving them a short walk of about ten minutes to and from school. In a time when children were walking several miles to and from school daily, the Wright children were most fortunate. Over the course of the next three decades the seven of the children of Asahel and Martha Wright would make the short trek up and down Dayton Troy Road in the name of formal education. Another feature of the social network blooming on Dayton Troy Road at the border of the townships was the new post office. 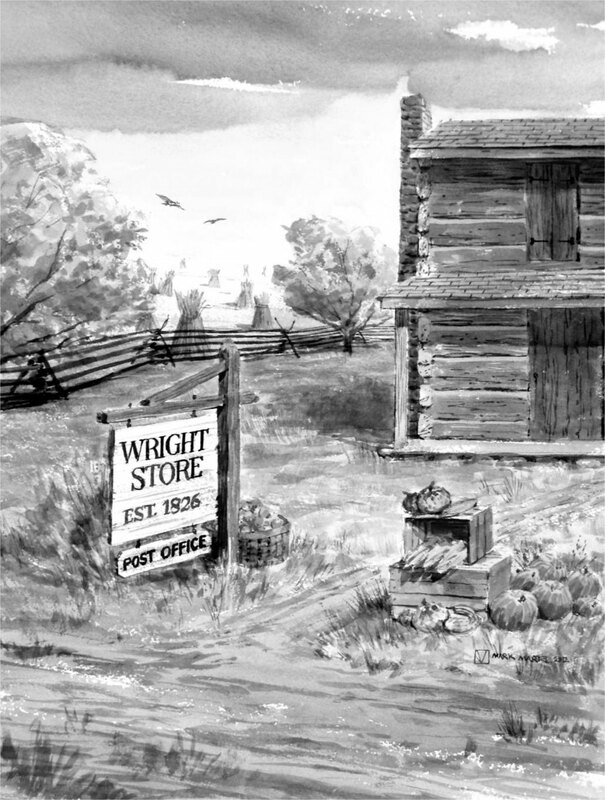 When Asahel Wright opened his general store in 1826, it became a station for sending and receiving mail carried by the United States postal service. As such it was another magnet of social interaction for the area. It would bring people into the area to drop off a letter or to check on anticipated correspondence. It would not be uncommon for someone in the store making a purchase to be told that a neighbor had a letter or package waiting for them. Such was life in this small rural hub of the community. goods such as calicoes, flannels, domestic plaids, and thirty-seven-inch wide rolls of brown cotton goods. He also stocked food staples, such as the best green coffee and bulk teas, along with grains and produce from the fields and trees of his farm. Items listed in extraneous Centerville records show hardware products such as padlocks and hand saw files available, as well as nonessentials like whiskey and tobacco twists which were in his inventory. Lewis E. Atherton in his book The Frontier Merchant in Mid America described the stages of development of general stores and their inventories. “A typical rural general store of the early 1800’s had an inventory of tea, coffee, flour, sugar, salt, and spices in bulk quantities. There was an open barrel of brown sugar which was less expensive than white sugar. Everything was stocked in bulk and weighed out into bags, crocks, or tins. One could find kettles, pots, pans, dishes and other items for the kitchen. Hardware such as axes, log chains, saws, or a rake could be found in the store. Also domestic items such as cloth by the roll, drugs, dry goods, and small selections of books were generally available”. With the inventory that Asahel Wright moved up from Wayne Township, which was tax valued at one thousand dollars, he would have a well-stocked store to meet the needs of the local community. In total these four institutions, the church, the school, the post office, and the general store, created a social hub along Dayton Troy Road where the people of the area regularly crossed paths. With the dynamic commercial development that has evolved along the northern border of Wayne Township today, spurred by the location of Interstate 70 which replaced the National Road, it’s hard to imagine, but one hundred and eighty years ago, this little stretch of Dayton Troy Road was a magnet for a rural community in a slower and quieter time. When Asahel Wright came to Bethel Township the towns of Brandt and Tipp City did not exist and the small community of West Charleston had not yet reached its heyday. His was the neighborhood store of its time. When residents of the area had the time to dedicate a day to travel, they could go to Dayton or Troy to make the larger purchases that they needed, but day-to-day needs were met at the local general store. It was a time when children walking to school could be given an errand of dropping off a letter at the post office after school, or stopping by the general store to pick up something needed in the kitchen on their way home. The Wright store would be a mainstay of the Bethel Township community for years to come.